Steven Universe made a triumphant return last night, back on a normal weekly format after recent scattered, concentrated releases of episodes. Despite the change in schedule, in “Nightmare Hospital” the show is still doing what it does best: defying expectations and being one of the most emotionally smart cartoons on TV. Going in, “Nightmare Hospital” was initially played up as a “scary” episode, as Connie and Steven are tasked with sneaking into Doctor Maheswaran’s office at the local hospital to retrieve Rose’s sword, which the strict mother had confiscated after finding it in Connie’s possession. Do you know how many children I see every day in the hospital who’ve cut their faces off playing with swords? NONE! Because they all have parents who love them, and who don’t let them play around with deadly weapons like some kind of gang member! But the real spookiness begins that evening as the kids conspire to infiltrate the hospital, where Dr. Maheswaran has been called in to see a new patient, and get Rose’s sword back—and to a little kid, there’s nothing scarier than a hospital at night, especially when its darkly lit and eerily quiet. Steven Universe masterfully captures this ambience brilliantly, but with a brilliant skewed sense of detail: all the backgrounds of the hospital hallways we see are stretched and scaled, making them appear strangely wide and huge... because we’re meant to be seeing them through the eyes of Connie and Steven. To a child (especially Steven, who says he’s never been to a hospital before), Hospitals are impossibly huge and gaping and vaguely sinister at the best of times, and the show’s backgrounds capture that feeling brilliantly, and that’s before we get to the actual body horror: Dr. Maheswaran’s patient isn’t a car accident victim, it’s a fused gem mutant! Naturally, the good doctor doesn’t immediately freak out, but instead assumes that she can’t find a pulse on the writhing mass of grunting limbs because her stethoscope isn’t broken. It’s played for laughs—and it’s nice to think that Dr. Maheswaran is less concerned about her patient being a monster and more about treating them—but at this point, you have to wonder what the non-Gem citizens that populate Steven Universe’s world actually pay attention to sometimes. Are they oblivious to the strange things happening right in front of them? Are alien creatures and superheroic Gem beings just blasé at this point? I think in Dr. Maheswaran’s case, the answer is neither: her primary concern isn’t these bizarre creatures, it’s her daughter, and whatever’s actually going on with Connie and Rose’s sword. It’s Dr. Maheswaran’s silent face of horror immediately afterwards that catches you off-guard, though: she wasn’t scared of the Gem mutants. She’s more petrified that she doesn’t know her own daughter, and it’s heartbreaking. This is where “Nightmare Hospital”—and Steven Unvierse as a whole— shines. The fantasy action of the gems is never the real focus: it’s the relationships between the characters, emotional beats ready to stab you in the heart at a moments notice. Connie and her mother’s heart-to-heart in the Hospital car park after the ordeal is a pitch-perfect conversation between mother and daughter, tinged with regret. 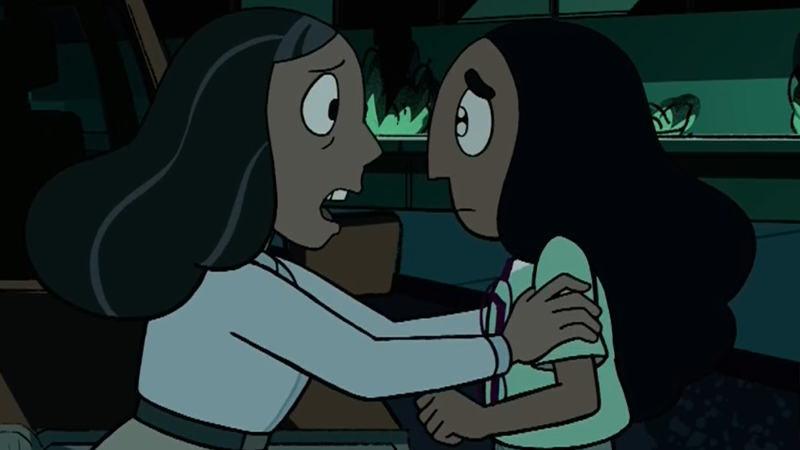 Connie is upset that she had to lie to her family to keep her life (and friendship) with Steven safe, her mom sad at the realisation that she’s been too protective of her child, a fear many parents have, and that it’s lead to Connie not talking to her, and that scares her more than anything Gem-related ever could, because she’s a mother. After 10 minutes of swords and monsters, it’s refreshingly, stunningly real, and elevates a good, creepy episode into a great, emotionally complex one. What parent and child hasn’t had a conversation like this growing up? Just, you know... without the crazy monsters and giant pink Lion in the background. Without a mother of his own to embrace, a mother who had already let him grow into this strange world on his own, Steven hugs Rose’s sword. When did it suddenly get so dusty at my desk?